A Washington living trust form is a legal document that is drafted to transfer a person’s assets on to their named beneficiaries upon death. Our free Washington living trust forms are very popular estate planning tools that can be utilized to avoid probate and court supervision of your assets. When filling out Washington living trust forms, the assets that you own are placed into your living trust. These assets include your real estate property, checking and savings accounts, vehicles, investment accounts and more. You decide the assets that are placed in your Washington State Living Trust. The trust assets are now assigned to the living trust and managed by you during your lifetime for you and your beneficiaries benefit. Once you pass on, the assets placed in the Washington living trust are then distributed to your named heirs. With Washington living trust forms, you name your trustee and successor trustee – the person or persons who will control your assets when you are alive (this is most likely yourself) and when you pass on (it should be someone you trust in entirety). You also name the beneficiaries in the living trust who receive your assets when you die. 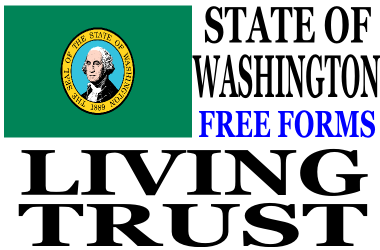 Fill out and print free Washington living trust forms online. Once you pass away, your Washington living trust allows for all assets to be transferred to your beneficiaries promptly and privately. It is for this reason that Washington living trust forms are an integral part of a well thought out estate plan. The person drafting the Washington living trust forms, called the grantor, transfers assets into a Washington living trust during his or her lifetime. Once written, the Washington living trust becomes the actual owner of all the property placed in the trust. Now, the same person who created the trust becomes the grantor, successor trustee and beneficiary of the Washington living trust and retains all control of the property that was put in the trust. You can assign real estate, bank accounts, automobiles, stocks and more to a Washington living trust; just about any type of asset you choose. In the event the grantor wants to change the Washington living trust, it can be changed or revoked at any time. However, a Washington living trust may only be changed or revoked before the grantor’s death. This is why a Washington living trust is also known as a Washington revocable living trust. Once the grantor dies, though, the trust becomes a Washington irrevocable living trust and can’t be changed in any way. Now, the named successor trustee assumes management of the Washington living trust. The successor trustee will now distribute all the assets placed in the Washington living trust by the grantor to the beneficiaries named in the trust. Once all assets are disbursed, the Washington living trust is then terminated. Once you have finished drafting your Washington State living trust form, you will need to find a safe place to store it. This should include all of your estate planning documents. Not only your living trust, but also your power of attorney, last will and testament, and pour over will. Your successor trustee will need the original Washington living trust forms immediately after you pass on to take care of all the necessary obligations of the trust. A Washington living trust allows heirs a way to avoid probate and court supervision of your assets. Washington living trust forms are private documents and aren’t public knowledge – like a Washington last will and testament. You don’t have to hire an attorney to draft Washington living trust forms. A Washington living trust will take care of your affairs if you become incapacitated. Washington living trust forms are valid in all 50 states in case you move. Bear in mind, writing a will in Washington is still highly recommended. You could have property that you forgot about, inherited or bought after you create a living trust in Washington. Once you have completed your Washington living trust, you will need to sign the document in the presence of a notary public to make it valid. You will need to take two forms of identification with you. The notary will sign, date and stamp your trust. Your Washington living trust form will then be a legal and binding document and your successor trustee will be able to quickly step in a take care of your affairs.